We usually have a selection of quality used saddles for sale. English and Western. We have a few starter models, trail saddles and show saddles. Click on each page for more photos and information on each saddle. Shipping can be arranged for actual cost. This is a well made older Silver Royal. Back when they were made by Circle Y. The nice ones. Heavy duty leather, real silver accents, fully tooled. A great show saddle. Full QH bars for that wider horse. Used very little, the leather is still like new. This is a 17" Collegiate Close Contact Saddle. Only used for showing and a few lessons. Still nice enough to show in. 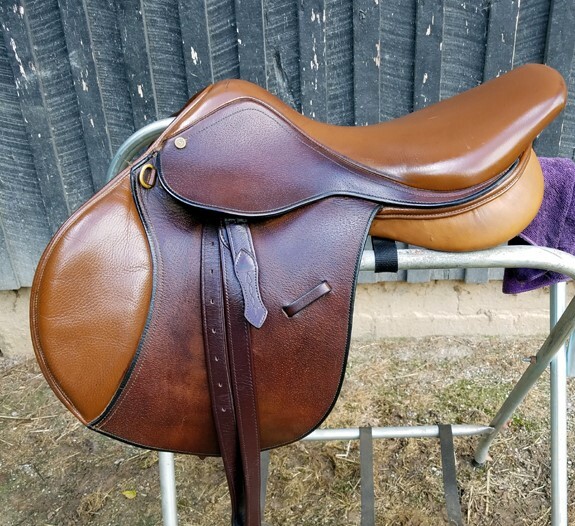 Great saddle for someone wanting quality at a good price. This is a flashy black saddle with fancy silver and gold inlaid plates. 16" padded suede seat. Complete with rear cinch, breastcollar and bridle. Great starter set, ready to go. Black Genuine Eli Miller Trail Saddle. It features a 16" seat with wide flaps and english type leathers. Padded stirrups for a softer ride. Front and rear cinch rigging. Barbed wire tooling. This is a used Australian Saddle. It has the deep seat and large knee rolls that really hold you in on rough trails. It fits like a Semi QH tree. Good starter saddle at a great price.